Did the United States Ever Really Have a China Strategy? Instead of engaging China, the United States could (with great cost) have isolated it. 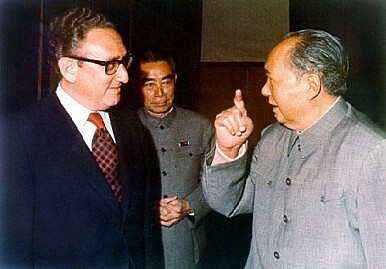 In a recent interview with the National Interest, former U.S. Secretary of State Henry Kissinger accepted some responsibility for bringing China into the international system. Instead of engaging China, the United States could (with great cost) have isolated it. Was there an alternative to engagement, a way to avoid the growth of great power rival? First, to call long-term engagement a “strategy” might go a step too far. The United States clearly facilitated the growth of Chinese power after Sino-U.S. rapprochement in the early 1970s. This included improved terms of trade, diplomatic support in international venues, and on some occasions direct military assistance. The U.S. supported China because it saw Beijing as a useful counter-weight to Moscow and (to a lesser extent) New Dehli. After 1989, the United States no longer saw an increase in Chinese economic and military power as a useful end in and of itself. Rather, Washington preferred to believe that Chinese economic growth (supported by trade and investment from the United States) would inevitably produce regime liberalization, and potentially the collapse of the CCP. At the very least, integration into the liberal international economic order would “tame” China, and make it a positive contributor within that system. Whether this amounted to a China “strategy,” or merely a way to rationalize the preferences of American firms which wanted access to China’s markets and labor pools, the engagement of China brought much heavier trade, investment, and integration between the U.S. and Chinese economies. The United States eschewed the tools that states often use to keep potential competitors down, preferring to believe in the possibility of positive sum outcomes. Moreover, apart from a few China alarmists and protectionists on either side of the political divide, this approach earned bipartisan support within the United States. None of the Bush, Clinton, Bush, or Obama administrations have acted very strongly (or really at all) to slow the integration of the U.S. and Chinese economies. It helped, surely, that Deng Xiaoping deliberately avoided international confrontation, or a military buildup, during his tenure. It also certainly helped that the United States distracted itself from China during the 2000s, by becoming embroiled in Iraq. Has Chinese behavior in the East and South China Seas (ESCS), combined with China’s military growth, demonstrated that this approach is fatally flawed? Maybe. The CCP has stubbornly refused to collapse, and China’s military and economic growth have continued apace (albeit with some recent bumps). And over the past three years, China’s behavior in the ESCS has demonstrated, to many, that Beijing holds fundamentally revisionist views. I have my doubts, at least regarding how conclusive the evidence is. With respect to China’s military growth, there was no universe in which China was going to begin to act like Japan, with 1 percent of GDP dedicated to defense and an isolationist foreign policy. Thus, an increase in China’s military capabilities was the inevitable consequence of the growth of the Chinese economy. Moreover, China’s relative military weakness in the 1990s stemmed directly from a policy decision to delay defense modernization in preference for economic growth. And while China’s neighbors are surely correct to worry about the its forays into the ESCS, thus far the “hard power turn” taken by Beijing has proven, by historical standards, remarkably mild. China is attempting to take the South China Sea by creating and leveraging fait accompli. That’s worrisome, but as great power intimidation of the neighborhood goes, it’s small potatoes. Beijing has assertively pushed and bent the rules, but it hasn’t yet stepped outside of them, and it’s not obvious that it intends to. The biggest problem is this; too many defense and foreign policy analysts in the United States proceed from the deeply unrealistic baseline that the United States can, or could have, maintained the global military dominance that it achieved in the early 1990s. This dominance was an artifact of the collapse of the Soviet Union, and the slow growth of other competitors. It was not sustainable over the long term. States which appreciate that U.S. dominance was unsustainable, and that choose to act accordingly, are not being revisionist and aggressive; they’re being realistic.